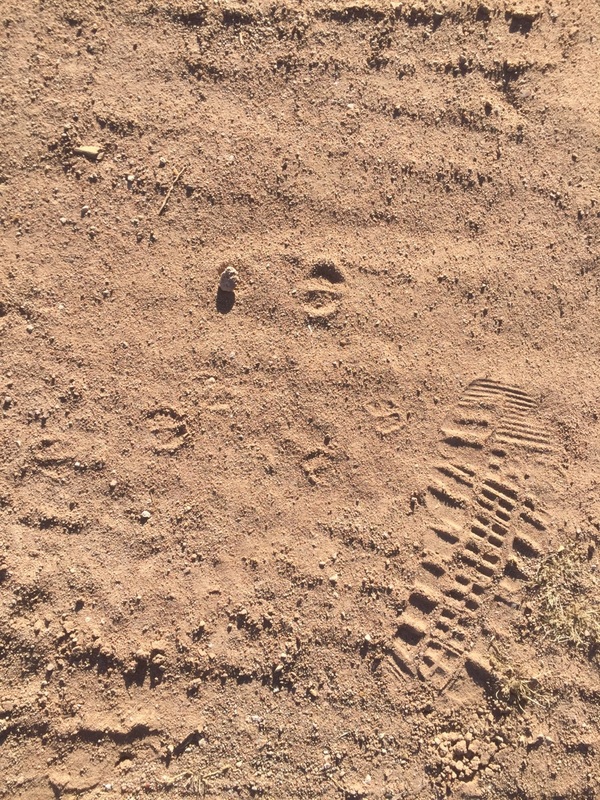 But every time I see tiny little hoofprints like that I wonder: Why don’t we have any javelina? I’ve never seen any, I’ve never heard stories of any, and after all this time I have to believe there aren’t any. But why not? I’ve always wondered. I think the missing Javelina may be a combination of altitude and cold winters. I don’t recall seeing them much above 5000 feet even though they are common in the areas around the Sky Islands of SE AZ. I’ve seen javelina in the southern Bradshaws – central Az at around 6k’. Fwiw. Javalina are common in the general area where I live but I rarely see them around the property – whereas in the nearest town I hear tales of them digging up flowerbeds and the usual mischief. Up until this last year where a local group showed up for a couple weeks and decimated a few stands of prickly pear – the only other javelina I’ve seen here was when a single male discovered a pumpkin that had volunteered in the fenced compost heap. The pumpkin vine had grown up over the fence and I’d been looking forward to picking it once it had matured – but I came out one night to find this large and noisy beast enthusiastically scarfing it down. I don’t think I’ve ever heard of javelina north of the Mogollon Rim. I asked around after seeing them in the Bradshaws around 25 years ago and it was suggested that they’ve expanded their range in areas where they can readily drop down into the lower deserts when it gets cold. I think it’s just too cold where you are, Joel – even if it is considered a desert there.